The Festival of the Cineteca Bologna is an amazing event. It’s all about classics, rare prints and the histories of cinema. As a regular moviegoer and as a young film critic you can dive into the world of films that had their premiere decades before I was starting to sit in front of a TV as a child. It’s a strange crowd of specialists and historians, archive directors and cinephiles from all over the world coming to Bologna at the end of June. So the relatively small festival has 2400 accreditated visitors (they don’t have a very strict accreditation policy though). So here’s an incomplete account of what I’ve found and discovered this year. Feel free to read it as a watch list for your home cinema. Fortunately, in our age, the only things that’s keeping us from travelling to the vast land of cinema classics, are our lack of motivation and a decent internet connection. (of course, it isn’t as good for most films than seeing them in cinema, for known reasons). But coming from a small city without a film archive, I can get my annual dose of classics with real cinema feeling at the Ritrovato. (Unfortunately it’s still a problem to get to see ans show older and rarer films far from the big cities, mainly due to license fees or not enough audience interest respectively). Leaving the technical quality debate aside, the feeling of a screening at the Piazza Maggiore Open-Air Cinema with 2000 to 3000 people has it’s charme, with the right kind of movie for this screen. One of those was „Casablanca“, shown on occasion of the Ingrid Bergman tribute (100th birthday). Her daughter Isabella Rossellini introduced it at the Piazza and highlighted its comic elements. I might write a bit more about the 5 interesting early Bergman films and the wonderful documentary about her I’ve seen, separately. I’ve also seen „Europe ’51“ by Rossellini for the second time and, despite of Ingrid Bergman, didn’t like it very much. Another of those big screen movies screened at the Piazza Maggiore is Kubricks „2001: Space Odyssey“. It marked the end of the festival on saturday evening. I was hoping to make my peace with it and finally get to like it instead of just respecting its handycraft merits. After all it was a 70mm print and I wasn’t tempted to fast-forward the painfully slow parts this time. But Kubrik’s space Story and I won’t get friendly in this life, I’m afraid. One of the reasons is, that there just isn’t an interesting character and the three parts don’t connect well. I’m still amazed at the finale, but I can’t find a lot in the middle – the fight with HAL – and the beginning with the discovery of the monolith. It’s a lot of fancy stuff, revolutionary for the time, I’m sure. But as a story… No, sorry, all you Kubrick fanboys – I like Shining and Clockwork Orange though! Perhaps my most interesting dicovery was „Bunny Lake is Missing“ by Otto Preminger (Innsbruck’s art house cinema association’s name patron): an extremely well crafted Psychothriller from 1965 centered around an American woman searching for her child and her sanity in old England. It’s a film you can’t tell anything about the plot without spoiling it. In this sense Truffaut is right, placing it in the line of those films strongly influenced by Hitchock – questions of originality aside, „Bunny Lake is Missing“ is pure suspense. The brother in the film is played by Keir Dullea, who links the two movies as he is also Kubrick’s lead astronaut Dr. Bowman three years later. „Woman on the Run“ (1950) was hailed as a rediscovery by the Hollywood Foreign Press Association. Restored by the „Film Noir Foundation“, it’s exactly that: a slick hunt for a witness in a murder case by the police, a journalist and his wife through the streets of San Franscisco. „Model Shop“ is the product of Jaques Demy’s adventure in America in 1969. Reminded me of „Zabriskie Point“ by Antonioni in its distant view of America and the portrayal of outsiders to the turbulent times of the Vietnam war era. Very much attached to its time, but an interesting look back, with a stunning Anouk Aimée. World-cinema-wise (called „La Macchina dello Spazio“ in Bologna), I’ve had a look at „Insiang“ (1976) by Lino Brocka from the Philipines and „La Noire de / Black Girl“ (1966) by Ousmane Sembene, the last being the first sub-saharan feature film ever apparently, despite of being painfully boring. Both are veteran directors restored by Scorsese’s World Cinema Project. Unfortunately both films are too upfront in its portrayal of the political messages, i.e. too focused on the tragedies, that I can watch it as stories. Important though, I’m sure. Bologna also presented the franco-tunisian filmmaker and photographer Albert Samama Chikly (titled Prince of Pioneers). Together with his daughter who lived till 1998, he made the first film of the continent („Zohra“) in the 20ies, when the Mediterranean sea was still a connecting sphere. She wrote and acted, he filmed and directed and the result is astonishing (presented with live music). Unfortunately I didn’t have the chance to check out the rest of the extensive Chikly programme, presented in Bologna – except for a photo exhibition. Silent films always let me hesitate a bit. At Cinema Ritrovato they are presented in the best way possible: with live music. The programme dedicated to Leo McCarey even included a screening of three of his Stan & Laurel sketches at Piazza Maggiore with a whole big band – „seriously funny“, as the subtitle says. I decided to fight more against my hesitation concerning silent films, at least at next year’s Ritrovato. Music was also important with „Kiss Me Kate“ and „All night long“, the first being an over-the-top musical comedy, screened in digital 3D, the second an adaptation of Othello set in the London jazz scene of the 1960ies with Jazz stars playing themselves in it. As smooth as its diegetic music which integrates perfectly into the setting. Another trip back to the 60ies/70ies was the documentary „12 Dicembri“. Certainly less enjoyable than the USA shown in „Model Shop“ or London in „All Night Long“ this interview-loaded document shows the broken political climate of Italy after an bomb attack on 12th of december. One year later Pier Paolo Pasolini himself, without admitting his deep involvement in the project at the time due to the legal dangers, looked at worker’s union movements and the left-wing activists (wrongly) accused by the state for the attack. He shot about 60 percent and especially the interviews are very much in the intimate style of his „Comizi d’Amore“. It’s a panorama of a society at the brink of collapse, its democratic structures in the grip of an post-fascist elite, trying to prevent a left change by all means in their possession. „It was a time, more than any other, when we came close to losing formal democracy in Italy.“ – P.P.P. One of the presenters of the movie compared it to present situations, explicitely to the extortion of Greece by European neoliberal elites. The film was shown in a 104 minute version restored from various sources in 2014. The beginning was a beautifully strong, several minutes long drive alongside an endless protest march with a voice-over. Although I’m not able to relate to the revolutionary language of the time („class struggle“) and don’t know enough of the specifics and Italian politicians back then, the raw direct interviews with workers transfered their sense of urgency to the screen. Still more of a document then a finished film. The appropriate feature film screening in Bologna to this Italian documentary would have been „Rocco e sui fratelli“. I only watched the beginning of the 177′ Visconti-Epic from 1960 at the packed Piazza Maggiore though. The last film I wanna mention is Manoel de Oliviera’s very personal „Vista ou Memorias e Confissões“. It’s an autobiography and Oliviera-family story set in his own house he had to sell at the time. In a way, it’s his latest published film, as he didn’t want it to be shown until after his death. It was made 1982. That, fortunately, took a long time, as he lived to be 106 years old. So the film had its premiere in Cannes this year. It’s a wonderful farewell by this director I still haven’t had a chance to discover. Maybe the Viennale will show some of his films this fall. After all they had his last images as their trailer in 2014. The most beautiful rewatch I had was Malick’s „The Thin Red Line“ which was shown in a unique dye-transfer copy, as the proud restaurator explained at the Piazza. Malick’s return as a director in the 90ies, it was also the most recent feature film I’ve seen in the Ritrovato programme. The classics are out there and so I still have to check out a few more of this year’s programme. Of all things, the opening film of Cinema Ritrovato Piazza Maggiore screenings is on top of my list: „Ascenseur pour l’Échafaud“ (Louis Malle 1958). At least it’s not my fault I didn’t finish it in Bologna as the screening was suspended due to the storm and rain. Just before the scene when Jeanne Moreau walks around Paris in the rain herself. This time she stayed dry. But the first 15 minutes were teaser enough for me to continue at home. 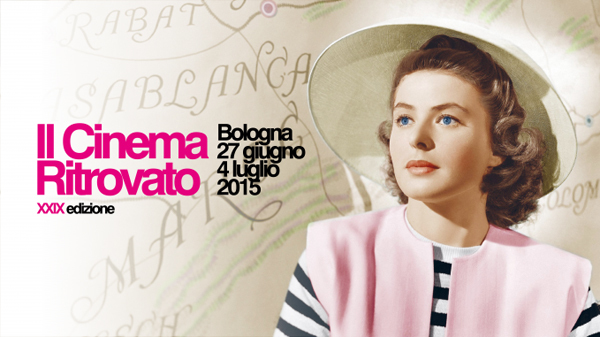 Il Cinema Ritrovato, a treasure trove of film history, „re-inventing cinephilia“. Next year they hope to open a new old cinema in the heart of Bologna, the Cinema Modernissimo. I’ll be there. p.s. : Unfinished screenings: Rocco e sui fratelli, Xi Nü.